Simplicity is the essence of the sloppy joe â€” meat + canned product + bun = done â€” and there’s something slightly pompous about a sloppy joe made from scratch. Still, when I saw a FreshDirect One-Click Recipe for Not-So-Sloppy Joes (and seeing as No matches were found for “manwich” on FreshDirect1 ), I decided to try it. Heat the oil over medium heat. Add the onion and bell pepper, and cook until softened. Add the beef and cook until no pink remains. Stir in the tomato paste, chili powder, cumin, black pepper, cinnamon, and salt, and 1.5 cups (or two tomato paste cans) of water. Simmer, stirring occasionally, until the sauce thickens. 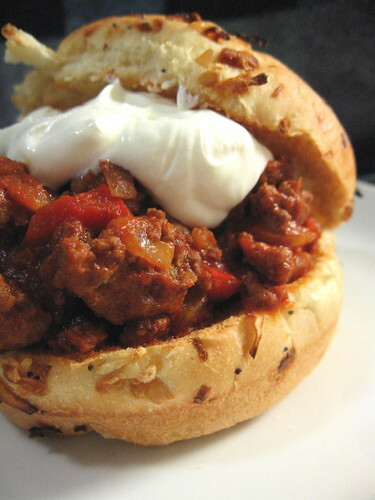 Spoon the beef mixture onto bun and top with sour cream. This was… really close to being great. The sour cream â€” something I never would have thought to add to a sloppy joe â€” added a much-needed tanginess that the meat alone was lacking. If the sauce had, I don’t know, some vinegar or even a diced pickle2 in it, it could have been much better. But for a recipe in which you probably have most ingredients on hand (ground beef languishing in the freezer, tomato paste you bought and promptly forgot about), it’s quite good and really easy. Pingback: not-so-sloppy(-but-really-it-kinda-was) joe on Flickr - Photo Sharing!